Disposable plastic Collimator Protectors are designed to keep the face of the scintillation camera collimators from becoming contaminated by infectious fluids. Protector sheets are backed with an adhesive for quick and easy application. 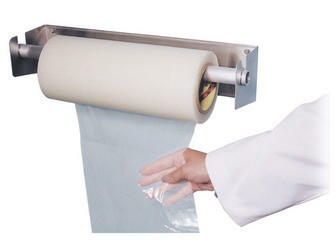 After use, peel away the contaminated sheet and discard. Apply a new protector between each patient. Protectors are packaged in perforated rolls. The optional dispenser is designed of heavy gauge polished stainless steel with an aluminum rod. Mount to any wall or door for easy access.